The head of the Libyan National Army. 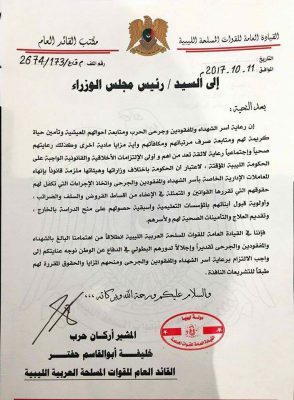 Field Marshal Khalifa Hafter, has written to the Beida-based interim prime minister Abdullah Al-Thinni telling him that his government must provide payouts for soldiers seriously wounded in the fighting against the militants and terrorists and for the families of those who died in the stuggle. Any outstanding salaries should be also paid and health and social care be provided for those in need. He also called for the wounded and families of the martyrs to be exempted from paying taxes and tuition fees or repaying loans as well as be provided with free healthcare insurance; for the wounded to be provided with all necessary treatment; and the children of the martyrs to be given priority in obtaining scholarships for study abroad. The authorities had a legal obligation to do this, Hafter said. The Thinni’s government’s ability to provide any of this is extremely limited. It has very little in the way of funds. Just as striking teachers in the east of the country have to look to the Presidency Council’s education ministry in Tripoli to resolve their demands, almost all the payments that Hafter is calling for would have to go through the Tripoli-based Central Bank of Libya. It likewise comes under the rival Presidency Council and its government of national accord.